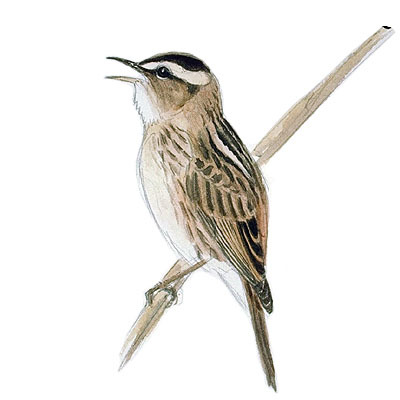 Like Moustached Warbler A. melanopogon in size (L 12 cm), but has snipe-like stripeas on head and with broad yellow-buff supercilium. Occurs commonly in marshland and around watercourses with unbroken stands of mainly sedge. Throughout its range the Aquatic Warbler requires habitat rich in large insects and spiders. Migrant. The Aquatic Warbler has suffered a dramatic decline in the EU, mainly in central Europe. The current breeding population is unlikely to excess a hundred pairs. The causes of this decline are the frequent loss of nesting habitat, mainly due to land drainage associated with agricultural development and the cessation of traditional hand-scything, resulting in the expansion of dense reedbeds and scrubs wich are unsuitable for the species.